Why make dinner boring with just another boring placemat? These placemats from Crocodile Creek are as functional as they are adorable and with their wide variety of styles there is sure to be a placemat for every child in your life. Each mat is made of polypropylene and is simple to clean with a moist cloth. 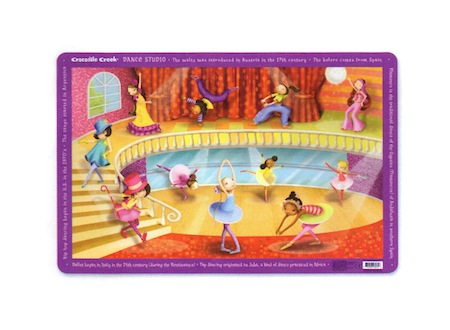 Each placemat measures 11" x 17" and this particular mat features 11 dancing divas each displaying a different style of dance as well as facts and trivia about the history of dance.